An American life, one day at a time. December 24, 1966: I’m dreaming. As I write this I am nursing a bellyful of post-Thanksgiving leftover turkey and gravy, and it’s impossible to tell from here whether we’ll have a white Christmas this year. It seems unlikely: Where I am, they don’t happen all that often. Indeed, I’m not even sure all the leaves will be off my tree by Christmas. They’re hanging on for dear life this year. The winter storm of Dec. 24, 1966, took place on a Saturday. So unless you drove a city plow or had last-minute shopping to do, you didn’t need to go out in it. Those are the best kinds of winter storms. It was big enough news to make the front page of the Dec. 25 New York Times, which reported thunder, winds over 30 mph, railroad delays, widespread accidents on regional highways, and the declaration of a snow emergency in the city proper. New York Traffic Commissioner Henry Barnes apologized for telling holiday churchgoers to stay home, but said it was the safest decision. The storm was widespread enough to bring South Carolina its first white Christmas in 95 years and to close the airport in Roanoke, Virginia, according to the Times. Ironically, the Dec. 24 Times reported on an unsuccessful effort to “bomb” clouds with dry ice in Franconia, N.H., so snow-starved, money-losing ski resorts could start doing better business. It failed. Unlike some other snow-day drawings on past calendars, my grandpa’s effort here looks like a frenzied mush — no church spires, roofs or TV antennae to be seen. If anything, his drawing looks to me like sea-waves swamping a freighter. Perhaps that reflects the intensity of the event. Since my grandparents were usually pretty prudent planners who probably had their holiday affairs wrapped up, I’m going to assume everyone stayed in on Dec. 24, 1966. I don’t believe 1107 Hope Street had a working fireplace, so maybe its inhabitants tuned in to a brand-new TV program: WPIX from New York chose that night to debut its now-famous televised Yule Log. The Times’ TV listings sum up an unusual new program. Less Yule-y options on the tube that night included “Get Smart,” “Gunsmoke” and a Canadiens-Rangers hockey game. Maybe the Blumenaus of Hope Street baked cookies or wrapped presents. Maybe they tried shoveling the driveway. Maybe those that played piano, practiced piano. Or maybe they just stayed cozy and let the meteorological craziness blow past and around them … until the night fell, and they went to sleep. And when they woke up, it was a white Christmas, and all things peaceful and generous seemed possible. Edit, 10:40 a.m., Dec. 25: We got one. 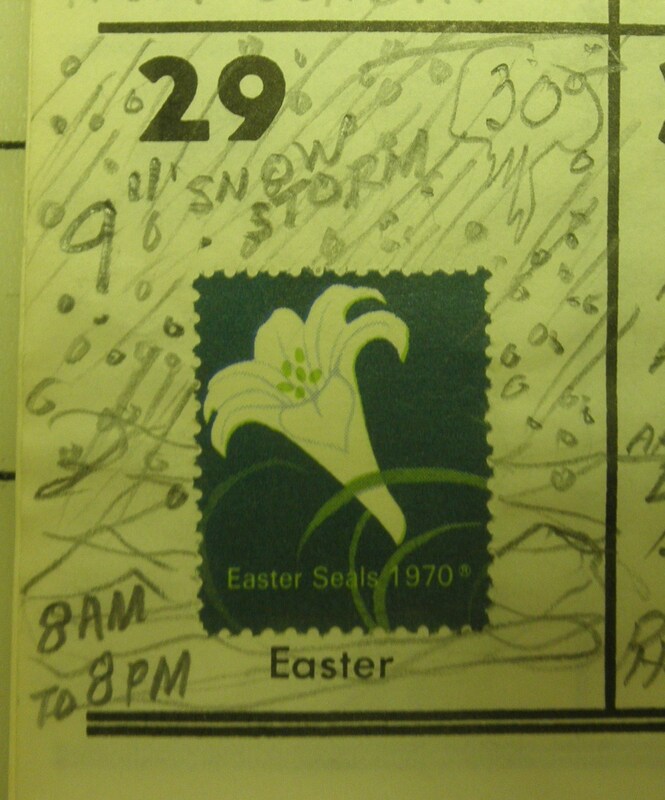 March 29, 1970: Behind the wall of snow. It’s been a challenging winter for a lot of people, including me. As I write this, the Lehigh Valley is about nine inches shy of setting a new record for its snowiest winter ever. I used to eat these winters for breakfast when I was a kid in upstate New York. They were just standard operating procedure. I had no more idea than a penguin has that other climates existed. And I still profess, as an adult, to like this weather. I watch hockey; I wear layers; I eschew a snowblower and hump the snow myself. I’m not near moving to Florida yet. I declare I never will, me, stomping my boot in the ice and setting my jaw firmly against the cold wind. But … these real severe winters are not as much fun as they used to be. I can only close my eyes and pretend I’m in Quebec (or Rochester) so many times. I can only go back outside to clean up the snowplow’s wet, heavy leavings so many times. And mentally evoking the hardy ancestors on the New England and French-Canadian branches of my family tree doesn’t work any more. Tabarnac! they say. You look back too much. Stop invoking your ancestry as though it meant something. We lived our lives; this one is yours. Go live it as if someone 200 years later was looking back at you. And stop whining. It was nice this past weekend — close to 50 degrees on Saturday, with an invigorating breeze. It felt like the dawn of spring. But, as my grandpa’s calendar reminds me, we’re not out of the woods. Winter can stick around for weeks yet. I seriously don’t know what I’ll do if we get nine inches of snow on Easter, in one of those snowstorms that begins with the work day and ends close to bedtime. Well, yeah, I know what I’ll do. I’ll put on a flannel shirt and my trashy jeans, and go out to the driveway again, and spit defiantly into the snowbank, and start shoveling. That’s what my grandpa did in 1970, give or take a few details. It will seem like a cold eternity … but I will once again shovel until the driveway and sidewalks and mailbox are cleared. And when the snow finally melts, I will treasure the first crocuses of the permanent spring as though they were the Stanley Cup. Sure, I'd love more email! Used to be every Monday; now every other. For more info on what this blog is all about, check out the About page.